Made with 100% fillet. No artificial flavours, colours or preservatives.Sometimes the simplest things are the best! 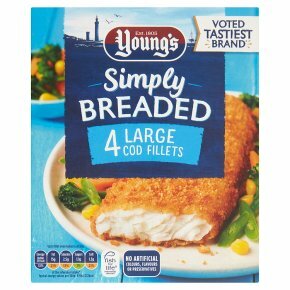 Take our Simply Breaded Cod Fillets. Succulent, responsibly sourced Cod wrapped in our crispy golden breadcrumbs. Simple & Delicious! Our Large Cod Fillets are best oven baked straight from your freezer.Ensure product is piping hot throughout before serving. All appliances vary, these are guidelines only.23 mins to oven bake.220°C/ Fan 170°C/ Gas Mark 6.Pre-heat the oven. Remove all packaging.Place product on a baking tray in the centre of the oven and cook for 23 minutes.